SWIFT Codes of State Bank of India (SBI) With City and Branches Names: SWIFT (Society for Worldwide Interbank Financial Telecommunication) (also known as ISO 9362, SWIFT-BIC, BIC code, SWIFT ID or SWIFT code) is a standard format of Business Identifier Codes approved by the International Organization for Standardization (ISO). It is a unique identification code for both financial and non-financial institutions. (When assigned to a non-financial institution, a code may also be known as a Business Entity Identifier or BEI.) These codes are used when transferring money between banks, particularly for international wire transfers, and also for the exchange of other messages between banks. The codes can sometimes be found on account statements. SWIFT and BIC codes are basically the same. The SWIFT code is 8 or 11 characters. SWIFT Code State Bank of India (SBI) used to Transfer fund to Internationl banks. SWIFTCode State Bank of India (SBI) INDIA are provide the broadest coverage of national bank identifiers. 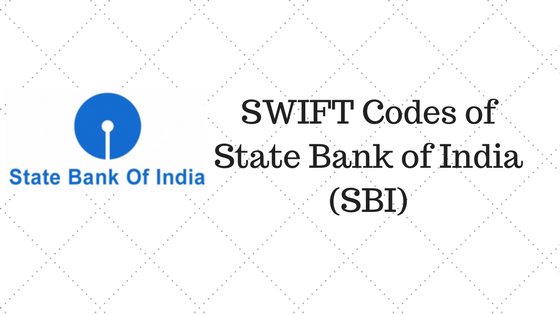 SWIFT Code is identifying State Bank of India (SBI) branches in INDIA. SWIFT Code of State Bank of India (SBI) is unique for each branch in INDIA. Here we provide the list of sbi branches swift codes in india.Kindly bookmark these page further information.